are robust enough to create an immersive experience for a student. are flexible enough to allow students to create their own geographic content. puts student in charge of how they see the world. Today I’m going to walk you through a step by step activity that I recently put together for an educator in the midwest who reached out to me via Twitter. (If you’re not on Twitter as an educator, GET ON IT!). He sent me an assignment that was for FWS (first-year writing students) where they would have to identify five places of personal significance and write a short rhetorical analysis about it. Originally the activity was done in Google Maps but the problem with Google Maps is that it only gives you a 2D experience. 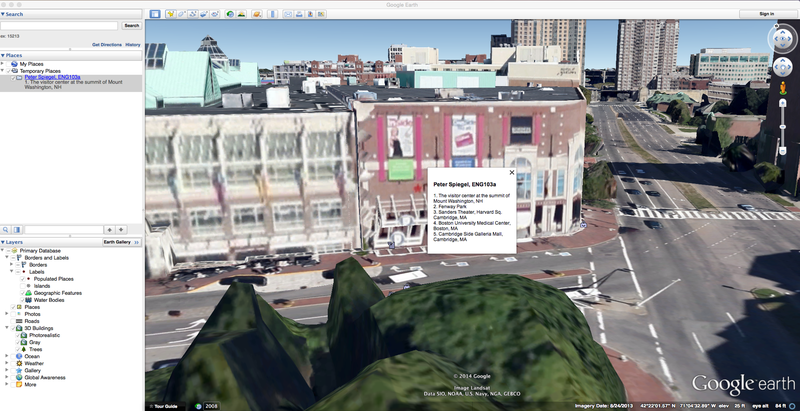 Google Earth allows you to experience a place spatially and get as close as possible to immersing yourself in a place without actually going there. 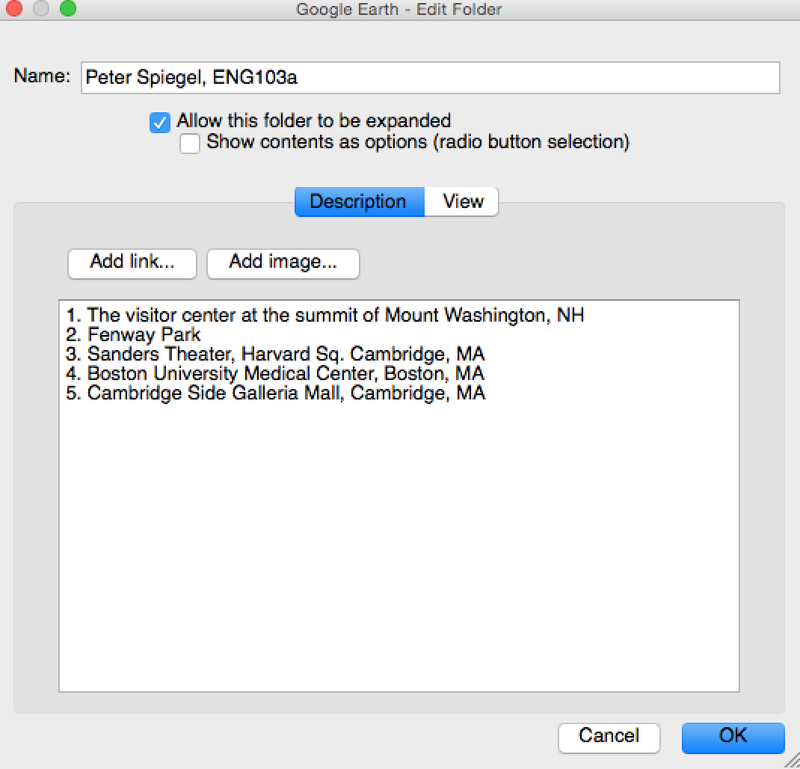 Task: Create a Google Folder that illustrates several places of personal importance. 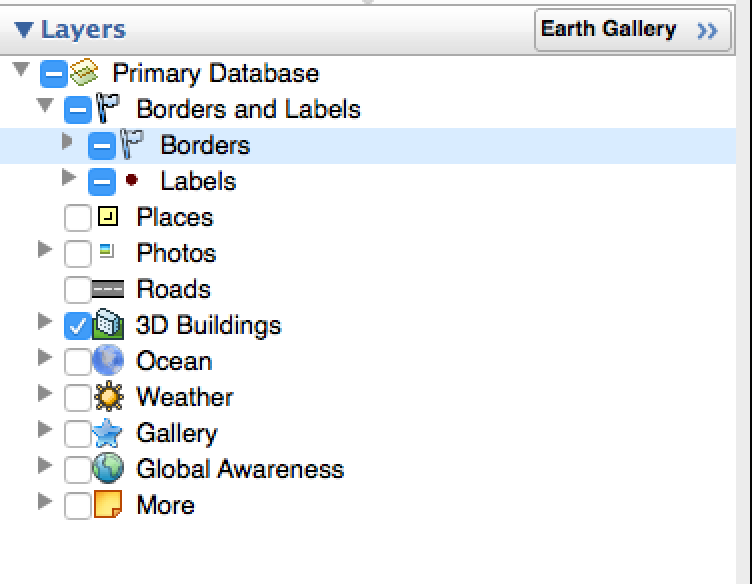 Open Google Earth… I know, it seems obvious but you’d be surprised how many people don’t realize that they have to open applications to use them. 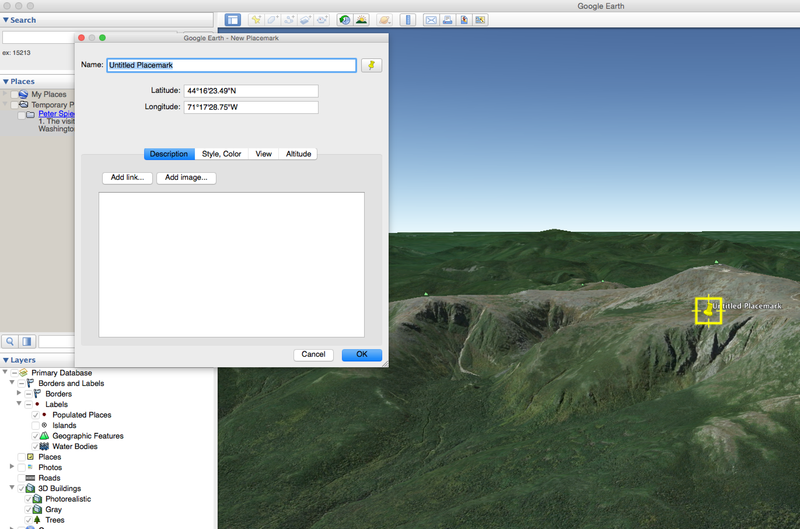 You can find the layers panel in the bottom left corner of your screen in Google Earth. 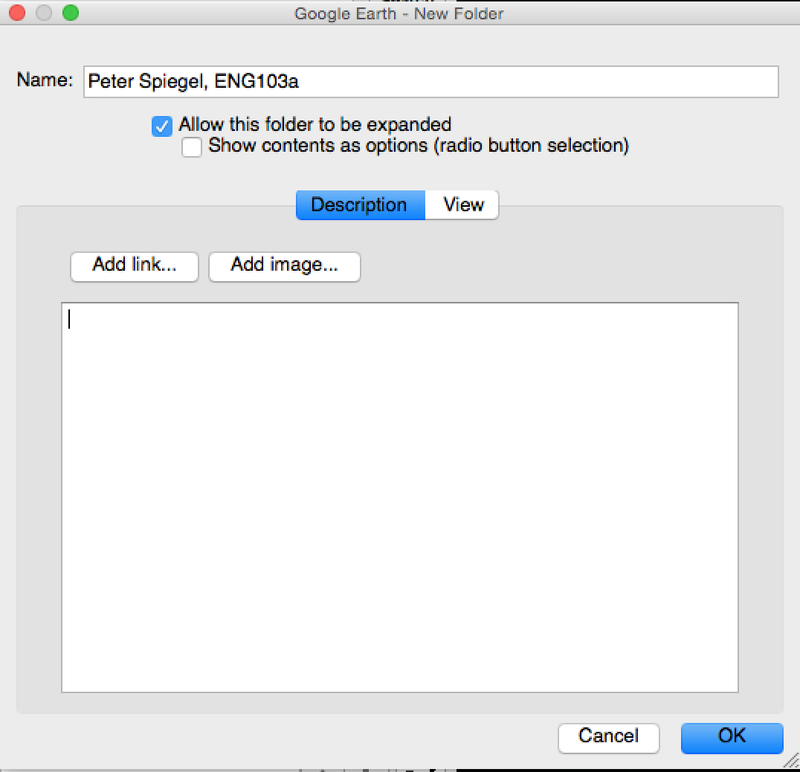 This will allow you to have a more powerful spatial experience when creating your folder. 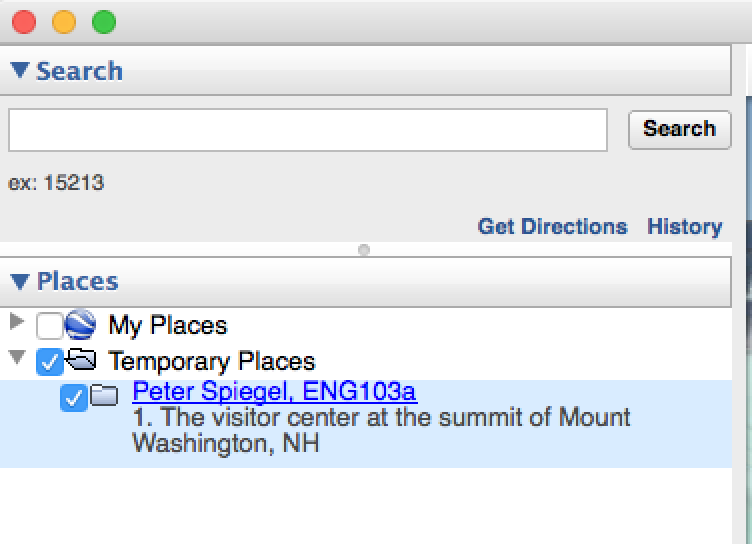 In your Places panel, highlight “My Places” and add a new folder. It is important to remember that you have to highlight the “My Places” folder before you create your project. 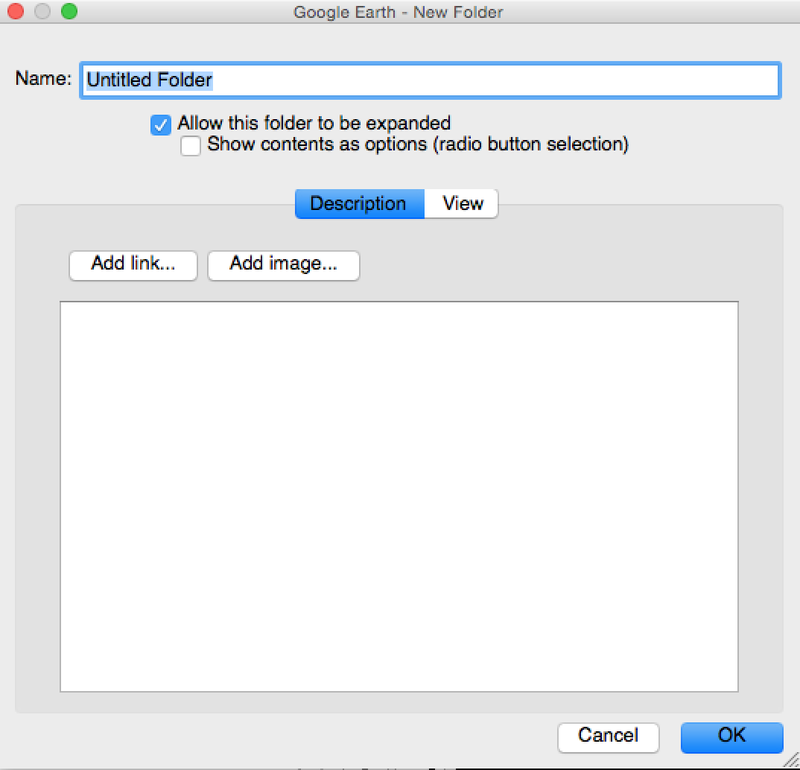 Google Earth’s default is to create new folders in the ‘Temporary’ folder. If you do this just remember to click and drag it into My Place before you quit. You don’t want to lose all the work you created! List 4-5 places of personal significance in the comment field of the dialog box. The reason for this is that when you click O.K. and close the box the title of the folder becomes a hyperlink and when you click it your information will be displayed in a dialog bubble. We are almost ready to start adding placemarks, but before we do a few words of advice about some of the quirks to GE. You will get confused when you start adding placemarks because you will forget that you have to HIGHLIGHT the folder you want to put your placemark in BEFORE you click “add placemark”. It is a common mistake and it happens all the time. I did it. You will do it. 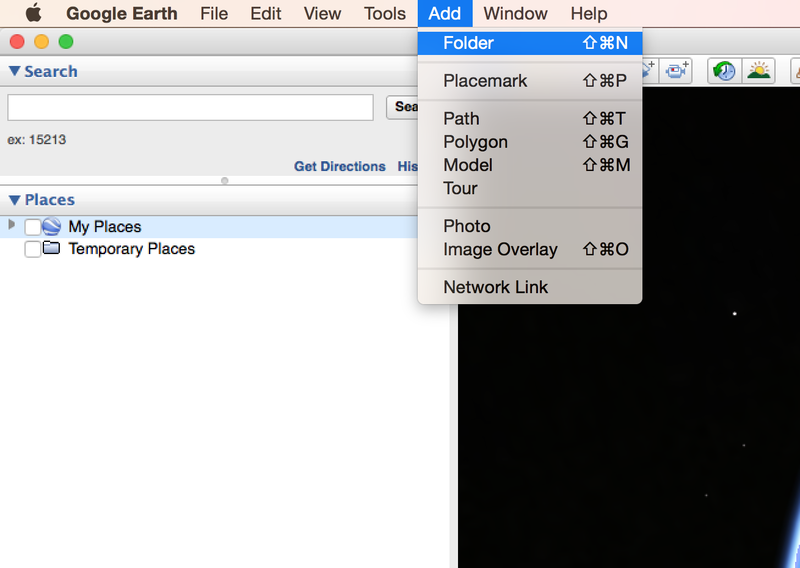 Just remember that you can easily ‘click and drag’ you placemark pack into the folder you want it in. You’re ready to create a placemark. 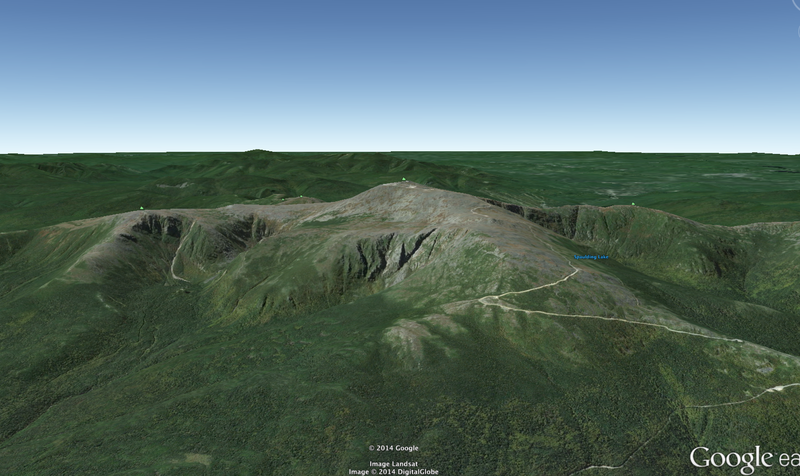 For my first example I’m going to use the summit of Mount Washington in New Hampshire. 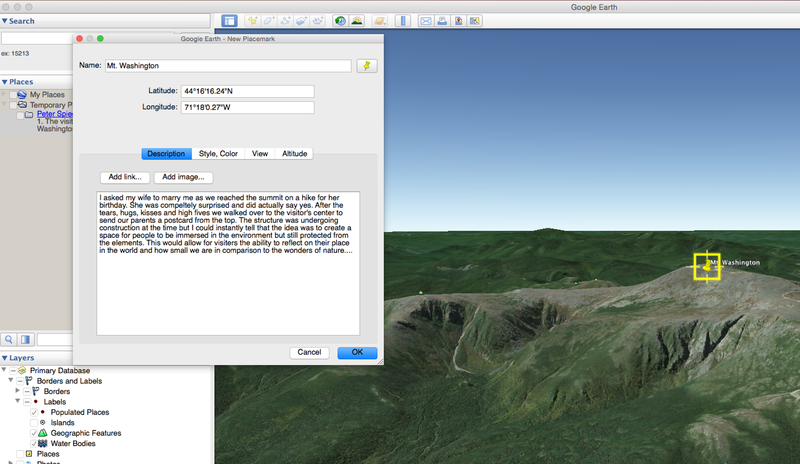 First I set up my view in Google Earth to something I like (see image below) then I will add a placemark. 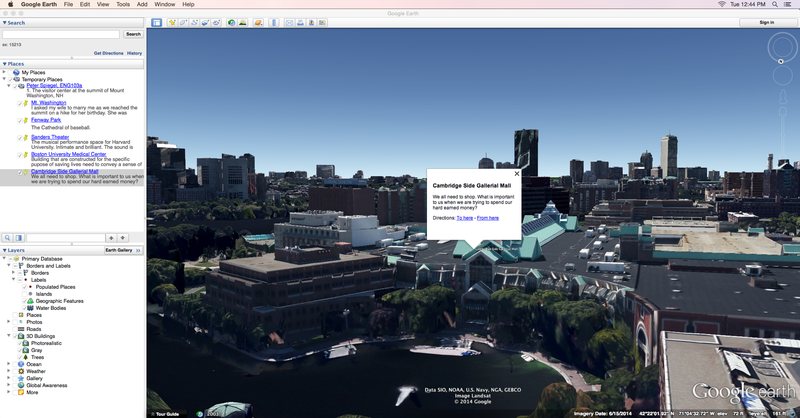 If you have forgotten how to navigate and fly to a perspective you like in Google Earth, check this post here. I’m going to change the name to “Mt. Washington” and then write my description paragraph in the comment field. Before I click ‘OK’ I’m going to click on the yellow thumbtack and move it exactly where I want to on the screen. Repeat this process for each placemark that you want to use. When you have finished you should have a folder complete with several placemarks, each with a description of the structure and it’s significance to you. Voila! It’s not that hard once you get a little bit of practice under your belt. 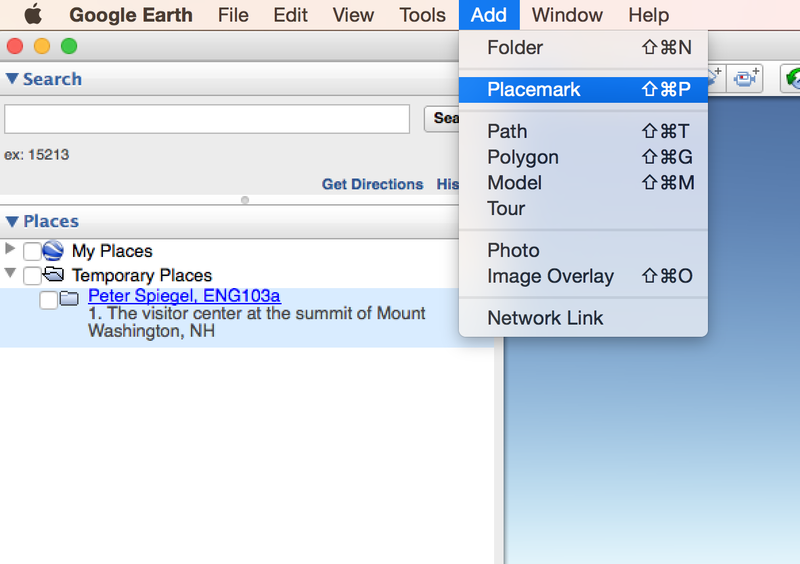 Tomorrow I’m going to show you how to change some of the placemark icons settings. You don’t need to have yellow thumbtacks for everything in Google Earth. There is quite a bit of personalization that you can include in your content.